Snapping turtle may sound dangerous, but they can actually be really good pets if you know how to take care of them. Whether you just purchased a turtle or are pondering getting one, know that it's not too difficult to keep care of a turtle. This article will tell you the basics of what you need to keep a happy, healthy turtle. Purchase an aquarium tank for your turtle. Keep in mind that the bigger, the better. Place water in the tank. The temperature should be about 72 to 82 degrees F and the pH level should be at 6.5 to 7. Feed the turtle as much live food as possible. Most turtles tend to like goldfish, crayfish, snails and crickets. You will also need to feed them commercial turtle food (found at your local pet supply store). Feed baby turtles every day and mature turtles up to 2 to 3 times a week. Provide your turtle with vitamins about once a week. To keep them healthy, give them vitamin D3 and B1 along with calcium. Clean your turtle's tank about once every couple of weeks or when needed. You want the turtle to have clean water, so make sure you have a big filter. The cleaner the tank, the healthier the turtle. Keep your turtle healthy. Do not overfeed the turtle. 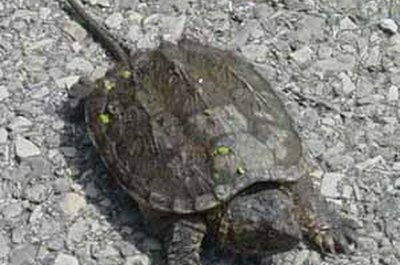 You can also take the snapping turtle for a walk on grass on a sunny day for exercise. If you think your turtle is sick, contact your vet immediately.